Right now you’ll find information and my opinion on different borough goings-on, tidbits that interest me, and random musings. It is my hope that soon this site will provide access to public information that continues to be quietly tucked away outside of the public’s view. Posted on September 22, 2018 by downingtowndaze CommentsNo Comments on Kardon Park has been saved! Kardon Park has been saved! In June 2017 the Pa Supreme Court ruled in favor of Kardon Park, but there was one sticky detail that the Commonwealth Court needed to fix. There’s a whole backstory to that, but it’s convoluted and confusing. Suffice it to say that the re-visit to Commonwealth Court never happened, and now it’s over once and for all. The final verdict is: THE BOROUGH CANNOT SELL OR LEASE ANY PORTION OF KARDON PARK. Period. The entire park is protected by the Donated and Dedicated Property Act, the Public Trust Doctrine, and our own Pa Constitution Article I, Section 27 (thank you to Peter Talbot for that). What will Borough Council do from here, you ask? Well, so far Borough Council has refused to start mowing the open fields, they’ve refused to remove the bogus “contamination” signs, and it certainly doesn’t look like they’re on board with accepting the Supreme Court’s decision and moving forward with restoring the PUBLIC’s park. Instead, it appears that the Borough is continuing to purposefully neglect the park. which was the primary source of water to the ponds? That’s right. The historic millrace had been operational since before Downingtown was incorporated as a town. Think about it…the family that built it in the early 1700s were British, because America wasn’t founded, yet. Now it’s gone. Destroyed. And now the ponds have no fresh water. Will the ponds fail? Perhaps that’s what the Borough is hoping for. Was destroying the dam legal? Nope. Not by a long shot. So how could that happen??! Collusion, perhaps? Conspiracy? Fraud? If you knew the details, you’d probably come up with a few other descriptive words. Can the mill race and dam be restored? Sure, but it would probably take another lawsuit. Raise your hand if you’re game! There are other administrative things that need to be done, too (like deleting the “Kardon Park Redevelopment District” from the Borough Code), but don’t hold your breath. We need a borough council that wants to move forward and serve the citizens by embracing Kardon Park and restoring the park to its prior beauty. It’s probably too much to hope for a council that would restore the water source to the ponds again, but that’s what the people deserve. Posted on February 25, 2016 by downingtowndaze CommentsNo Comments on Kardon Park is Heading to the PA Supreme Court! Kardon Park is Heading to the PA Supreme Court! After 7+ years, the Kardon Park battle is heading into the final stretch!!! The Supreme Court of Pa will hear the appeals of both sides (Friends of Kardon Park/Feldman/Kim Mfg vs. Borough/Developer). When will this happen? Maybe in September or maybe not until next year. There will be a volley of four legal briefs (bad guys, good guys, bad guys, good guys). The first is due March 29th along with multiple copies of the ginormous reproduced record, then each brief is due 14 days after the preceding one is filed. Folks, Friends of Kardon Park needs donations. Hopefully, the next time Friends requests donations it will be to help restore the park to its pre-litigation beauty! Until that time, money is needed for this final push. Let’s help Friends out so they WIN! By supporting Friends, that will send a message to the Government (Borough Council, in this case) that they DON’T rule over the people. They’re here FOR the people, and if they can’t figure out how to serve, they need to GET OUT..
At the Dec 16, 2015 council meeting, the Borough Council appointed the mayor and two council members to the Water Authority in order to take control. Council also created an $1,800/mo consulting job or retiring police chief McGowan (see McGowan consulting agreement 12-2015). Council prez added two things to the meeting that were not on the agenda. And, just to make sure the covered all of the illegal, unethical bases, they passed a KPark amendmemt 12-2015 in which they refund $250K of Peck’s deposit, among other things. It’s sickening. Posted on November 7, 2015 by downingtowndaze CommentsNo Comments on How low can they go? At the Nov 4 public Council Meeting, the Borough’s special solicitor for Kardon Park, Pat McKenna, read the proposed 2015 Amendment to the Agreement of Sale. This is an amendment to the Dec 2011 Agreement, which was a complete do-over of the Aug 2007 Agreement (that had two amendments of its own). How much money have all these revisions cost the taxpayer, not to mention the cost of continued litigation? A simple Right to Know Request should reveal the total legal fees over the past 9+ years (RTK forms can be found here). And, why have there been so many revisions? The 2011 do-over lowered the price of Kardon Park by approximately $80K in order to offset the legal fees the developer had incurred. How would the taxpayers benefit from Council reducing the agreed-upon price by over $80K?? Also, even though the Developer would pay the Borough’s legal fees up front, the total would be deducted from the sale price at closing, so the taxpayers would lose even more. A lot has happened since December 2011, and now the Developer wants Council to make even more concessions that will be at the taxpayers’ expense. How low will Council agree to go? We’ll find out on December 16th or sooner. Posted on September 1, 2015 by downingtowndaze CommentsNo Comments on Guest Post #3 of 3: If X supports Y and Z=Y, did X support Z? Answer: Yes, unless you live in the Borough. Guest Post #3 of 3: If X supports Y and Z=Y, did X support Z? Answer: Yes, unless you live in the Borough. The posted agenda on the Borough’s website does not mention either public hearing, even though both had been re-advertised in the DLN twice in August stating there would be at the Sept 2 Council meeting. That’s an awful lot of money wasted on advertising. It’s also enough to make a lot of residents VERY upset that their tax dollars are being wasted. It’s even worse if residents DO go to the meeting ready to speak their mind and…they say it’s not gonna happen??? And so it goes from worse to….absolute horrible. In the New Business portion of the agenda, it states that there will be an AWARD to the ONLY developer that responded to the Request for Proposals (RFP) and is the same developer who showed the Council the plan several months ago. The Developer called it “Union Place”. How nice. It’s the UNION PLACE AWARD. 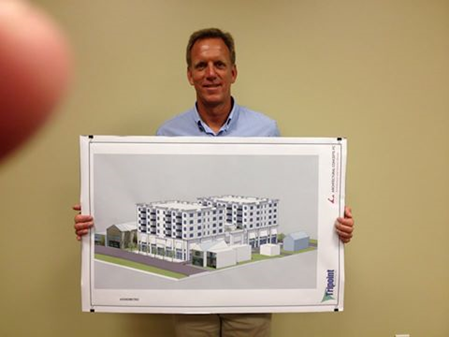 If you take a look at the photo below, the developer is holding up an artists rendition of his Union Place that would be located next to the former Minquas fire station and exactly where there is currently a parking lot with 66 spaces available. I found the photo at DowningtownMainStreet facebook page. There is more information about the building here on DowningtownDaze. There is also a link to an article from the DLN just above the photo. The last sentence: “The building is proposed at 75 feet tall. This would be about the same height as neighboring buildings, including the former Molly Maguire’s and the Dane Décor bell tower building on Lancaster Avenue.” Is the reporter BLIND or just writing what DMSA told her to write? TAKE A LOOK AT THE PHOTO, folks! This 8-story building towers over the old Minquas fire station and the building on the other side. This oversized monster is twice as tall as the 2 buildings on either side and does NOT add to the historic value of this section of Downingtown that IS in the National Register of Historic Places. Please read the other blogs here and come out to the council meeting and let them know you don’t want this in our borough! ANDY HICKS IS A MEMBER of Downingtown Main Street Assoc. There is something REALLY rotten in the Downingtown Borough Council! Below is the Agenda for the Sept 2 Council meeting. The agenda, found on the Borough’s website does NOT mention the public hearings that had been re-advertised in the DLN in August! What’s under “Deferred Business” mentions the Ordinance for the Woodbine Overlay District – but not as a public hearing where residents could voice their opinion of it. There is NO mention of the public hearing for the amendments to the Comprehensive Plan. It WAS re-advertised in the DLN AND mentioned in the Suburban Realtors Alliance online news briefs. The Borough of Downingtown will hold a public hearing to consider approval of amendments to the Borough Comprehensive Plan. The proposed amendments relate to the land use categories in Chapter 3: Future Land Use & Housing Plan Categories; and Chapter 5: Economic Development Plan of the Comprehensive Plan. The hearing will take place on September 2, 2015 at 7 p.m. at Downingtown Borough Hall, located at 4 W. Lancaster Avenue. A full text copy the Comprehensive Plan Amendments are available for public inspection, and/or copies can be obtained for a fee, at the Downingtown Borough Hall. AND BOROUGH COUNCIL OMITTED IT COMPLETELY FROM THE AGENDA???? If the Comprehensive Plan amendments are not voted on this Wednesday evening, there can’t be a vote on the Ordinance titled “Woodbine Overlay District”. JD Journal "Nothing but the truth"